After reading a number of exercise bike reviews and articles on the web, it struck me that the majority of these articles were written by people who have probably never even used an exercise bike. So I decided to put together a buyers guide, as well as recommendations for some of the better exercise bike choices on the market. 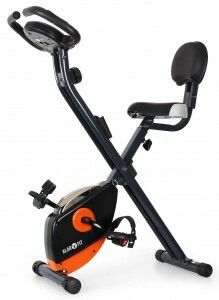 My aim is to create a guide to help you find the right exercise bike for your needs. This article was created with a UK audience in mind, therefore if you live outside of the UK, you may not be able to purchase the models listed in your country. Also, just so I don’t waste your time, these are mostly budget / mid-range home-use exercise bikes that are intended for beginner to intermediate users. If you’re a keen cyclist, these bikes may not be for you! Even the best quality exercise bikes can develop faults. So If you’re dealing with a company that doesn’t stand by their product, good specifications don’t mean a great deal. With every bike recommended here, I make sure to look into the seller’s customer service feedback. I try to guage their general attitude towards customer service. Whether through responses to customer complaints, volume of customer complaints versus glowing reviews; and / or complete lack of response to negative reviews. Always be sure to carry out your own checks though, since any seller can go up or downhill. I’m not going to make a blanket statement like “all cheap exercise bikes will fall to bits”, or rehash cliches like “you get what you pay for”, because that’s not ALWAYS the case. I’ve bought exceptional products cheaply, and I’ve also bought expensive lemons. It’s vital to check out the customer reviews regarding long-term reliability. When I refer to comfort I don’t just mean how comfortable the saddle is to sit on, since this can usually be remedied with a good gel seat cover. I’m referring to the smoothness of the resistance. 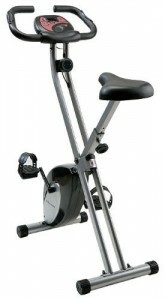 The cheaper exercise bikes typically use a belt or fan for resistance. The belt tension bikes tend to feel a little weird while pedalling, or at least that’s been my experience. Also, they have a tendency to get louder with higher resistance settings, since they rely on friction for resistance. 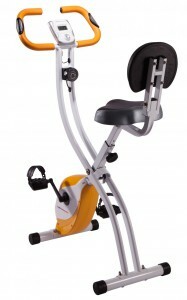 A better option is to look at the magnetic resistance exercise bikes. The good models typically provide a much smoother and quieter ride. If you’re in the market for an exercise bike with higher resistance levels, look out for the size and weight of the flywheel, since the bigger the flywheel, the greater the range of resistance. I think most people would prefer to have a quieter exercise bike, especially if you live with other people or have neighbours to think about. I suppose this really depends on when you intend to exercise, however, many people like to listen to music or watch TV while cycling and a noisy exercise bike can be disruptive. If this is an issue for you, I recommend reading user reviews regarding any undue noise for whichever bike you want to buy. 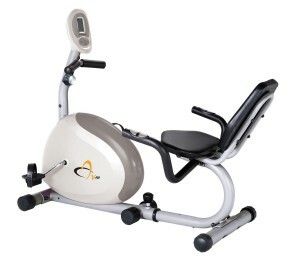 With the exception of foldable exercise bikes, the majority of non-commercial exercise bikes are comparable in the amount of space they take up. They do differ in weight, however, so if you intend to move your exercise bike around a lot make sure it doesn’t weigh a ton! If you’re stuck for space, a good foldable exercise bike may be preferable to no exercise bike at all, however, many offer little to no resistance and even beginners may find them unchallenging. Assuming you have the space, a good stationary bike with a heavy flywheel should keep you challenged long-term. We all come in different shapes and sizes. So it’s important to find an exercise bike that can be easily adjusted to accommodate you. Most people between 5’3” and 6’3” should be fine with a lot of home use exercise bikes on the market. However it’s always vital to check first. Pay close attention to the reviews regarding seat adjustability. Also, take note of the max user weight. 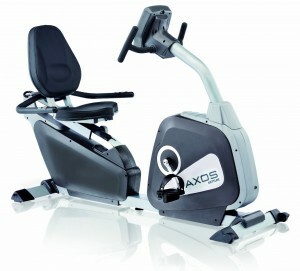 Some foldable exercise bikes for instance, can only hold up to 100 kgs. 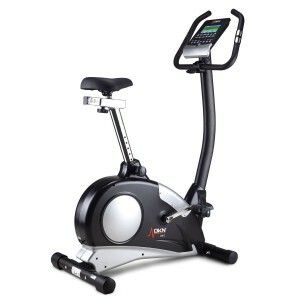 The exercise bike reviews will be broken up into various comparison lists, then recommendations will be made based on a number of factors including best value for money, average rating, pros and cons, personal experience, user feedback and suitability. The first set of bikes are foldable exercise bikes. I DON’T recommend these for more advanced users. These models are for beginners, or for people that need a foldup bike to save on space. After weighing up the pros & cons, value for money, build quality, manufacturer customer service and a few other variables, the Ultrafit F-Bike has been choosen as the overall winner. Alternatively, you could go for the newer model Ultrafit F-Bike which comes with back support. It’s worth considering if you need back support while cycling. The Klarfit X-Bike-700 Foldable Exercise Bike is a decent alternative to the Ultrafit F-Bike (with back support), if that’s what you need. It’s an excellent choice if you’re on a budget. 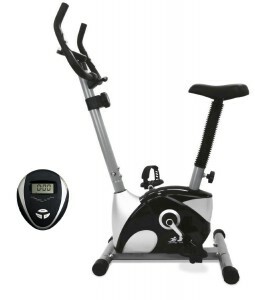 You don’t always get what you pay for, but these are entry level upright exercise bikes and are unlikely to WOW you. If you want to spend less, these models are perfectly adaquate. Personally, I would invest a little more if possible, but it really depends on your budget. The JF200 is the new and improved version of the JF100. Although, depending on when and where you buy, the JF100 often works out as better value for money. Having said that, I would personally go with the JF200 if it’s on offer and is within your budget. You can get the JF200 here. 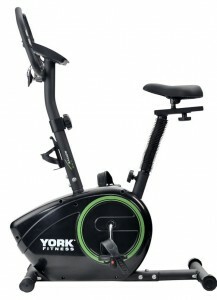 The York York Fitness Active 110 is the predecessor to the York C101 Cycle. It’s a decent home-use bike, however, from what I’ve read – York’s customer support can be a bit hit and miss at times. 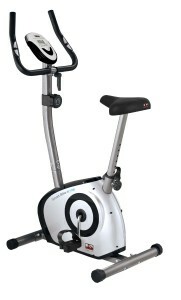 I personally used the C101 (my first stationary bike) for over a year without any major issues. As such, I’ve never had to contact York myself. I would recommend doing your own research first to be sure though. These bikes tend to vary alot in price depending on when and where you buy. They have similiar specifications, although for me the DKN AM-E edges out in terms of build quality and overall performance. The ZR8 is also a solid choice. Price fluctuations and offers not withstanding, it may be a little more expensive than the category winner. Given the minor differences in specifications, the AM-E would still be my choice. If you’re looking to save money, these are some of the better choices. However, if you can stretch your budget, I would personally opt for a mid-range model or better. 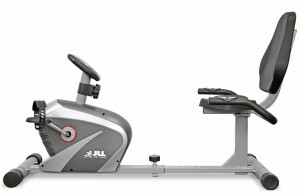 In my opinion, the V-Fit G-RC is a decent entry level recumbent bike. It comes with a 6kg flywheel, which should provide enough resistance for leisurely use. The RE100 comes with a 4kg flywheel but is often slightly cheaper depending on offers available. It may be the better choice if you’re wanting to spend as little as possible. Both of these models are excellent choices. The Kettler model comes with a slightly heavier flywheel, but is often more expensive (offers and discounts not withstanding). 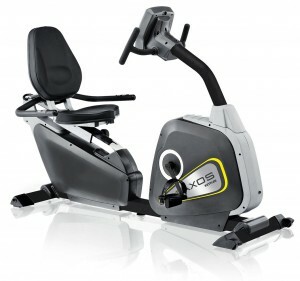 I would personally go for the Pro Form 350 CSX unless the Kettler is within a similar price range. 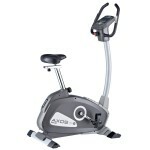 Thanks for sharing your thoughts on best exercise bike reviews. 2017 | Way Of The Dave . Com is a little vanilla. You could look at Yahoo’s home page and note how they create article headlines to grab viewers to open the links. Just what I was looking for. 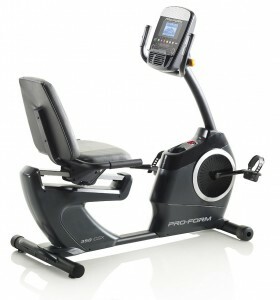 Came here by searching for best exercise bike reviews, thanks for the info. a more relaxed and smooth workout. 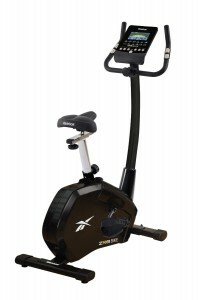 I think if you have a reasonable budget you should go for the York SB300 Diamond Exercise Bike. It costs around £320 on Amazon, but reviews say it’s close to a gym standard. Also, the Ultrasport F-Bike is hugely popular and is under £100, but this is more of a beginner / intermediate one. Hello you have a great website over here! Thanks for posting this interesting stuff for us! If you keep up the good work I’ll visit your website again. Thanks! and actual effort to create a great article… but what can I say… I procrastinate a lot and don’t seem to get nearly anything done. I was just looking for this information for a while. After 6 hours of continuous Googleing, at last I got it in your web site. I wonder what’s the lack of Google strategy that don’t rank this type of informative websites in top of the list. Normally the top websites are full of garbage. It's true, there is no such thing as spot reduction.Without menteig you or knowing anything about you, here's one possible routine.1) NUTRITION: Eat lean meats and veggies, nuts and seeds, some fruit, some starch and no sugar. Don't drink anything besides water. Google daily caloric needs and use one of the calculators to figure out how much you should be eating. Divide that into six small meals per day and make those meals according to the above guidelines. note: a meal is any time that you eat, even if it is a small amount of food. I like to put 2/3 of my calories into breakfast, lunch and dinner and 1/3 into snacks between meals.SLEEP: Get 6 8 hours of sleep per night if you can. 8 is much better than 6. Also, don't sleep more than 9 hours as it messes with your metabolism. Besides, you have work to do.MON, WED, FRI Strength training. I'm assuming you don't have weights at home so do 50 each of the following:1) Push ups 2) crunches 3) Lunges 4) Leg Lifts 5) Squat Thrusts (burpies)Go straight through with each one, don't stop to rest more than you absolutely have to. you can rest two minutes between each exercise but no more. Note: This will be hard to do. you will sweat and you will be sore, especially for the first week.TUE, THURS, SAT: CardioIf you have a bike, jump on the sucker and ride for 1.5 to 2 hours. Plot out a 15 to 20 mile course around your house and just ride it. Try to get a couple of hills in there. The great thing about bike riding is that most people can do it for a long time, and that burns a LOT of calories.If you don't have a bike, you're going to run. Plot out a three mile course and hit the pavement. If you have to start out run / walking then do that, but try to work up to jogging the whole thing, and eventually to interval sprints.This program will absolutely melt weight off you. No gym membership required, and no supplements or gimmicks. You'll feel great, full and have a ton of energy.Sunday you have off for recovery, so enjoy it! Can I simply just say what a relief to uncover a person that really understands what they are talking about on the net. You definitely understand how to bring a problem to light and make it important. More and more people need to read this and understand this side of the story. It's surprising you're not more popular because you surely have the gift.